A competition cooling radiator for Piaggio scooter or other gear. 587,09 € 587.09 tax incl. Specially designed and built for scooters competitions. This radiator MALOSSI MHR TEAM is the latest of the great Italian brand lion head. Of high quality material both in the materials used, its assembly or accessories that accompany it. 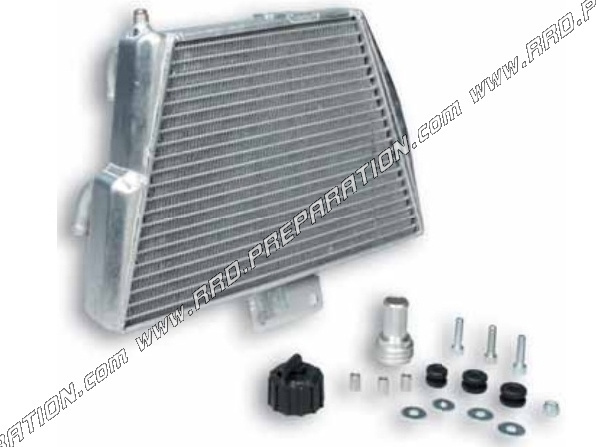 This radiator is made ​​entirely of aluminum alloy with oversized radiation stacks allowing excellent heat exchange and therefore an optimized and improved cooling of your engine. What has oversized stacking radiation? This can result in a very large volume (size of the radiator liquid water ...) and fins of strong and effective cooling that hold the liquid temperature high performance values. This set makes it possible to withstand the endurance, races, competitions ... the hardest. Its shape also helps to maximize the space in your fairing Piaggio scooter, to exploit to perfection the evacuation of hot air flow. The finish, welds are excellent and guarantee robustness / reliability. With this heater, you will have a template with a set of 3 PVC sheets, cutting yourself to create a circle on the radiator to prevent the flow of cold air from escaping sideways. Delivered 100% complete as shown with radiator cap, screws, silent bloc .... Mounts on scooter PIAGGIO ZIP SP liquid cooling after 2000, you can use it on other machines in order to adapt to a prototype, mécaboite, .... Photo and detailed description to come. You will find here all our cooling liquid range.